Los Angeles! City of Angels! City of Lights! And City of Freeways! The stories of monumental traffic jams on the asphalt maze that makes up the L.A. road system abound—who hasn’t heard at least one account of the overcrowded driving conditions of Southern California? The ground-bound citizens may not realize it, but the situation in the air over the greater Los Angeles area is no less crowded. Due to controlled airspace restrictions, standard routes for commercial airliners serving the various major airports in the region, and operations from a handful of military air bases, a lowly little VFR bugsmasher may find it difficult to find a route that goes from here to there without busting an FAA regulation or meeting another pilot face to face at 3,000 feet. Undaunted by this challenge, I have decided to help you thread the eye of this needle, and have planned a flight that cuts right through the middle of some of the busiest airspace in the country. So put your head on a swivel, dust off your altitude control skills (because you’re going to need them!) and get ready to go flying. Picking up where you left off in the last flight in the Los Angeles area, this flight will start at Catalina Island. Your destination is El Monte Airport, a mere 45 nautical miles (direct) from Catalina; you could just head directly for the mountains and you’d come out close to your destination. But flying direct is not a practical option. As with every Cross Country flight, I lay out the route so that you will comply with all FAA regulations (or at least, as much as possible). I assume that you’ll be able to use your radio to talk to the control tower at your departure and destination fields, but I try to pick routes that do not require that you contact Air Traffic Control in order to fly through controlled airspace en route. The portion of the Los Angeles sectional chart shows your highlighted route. Most of the shaded lines indicate the borders of controlled airspace. The marks are extremely crowded; if you want to see them in a more legible format, I strongly recommend that you get a copy of the Los Angeles Terminal Area Chart (TAC) which uses a larger scale and provides greater detail than the sectional. Another advantage of the TAC is that it has special VFR corridors printed on the reverse side, making it easier to find your way. 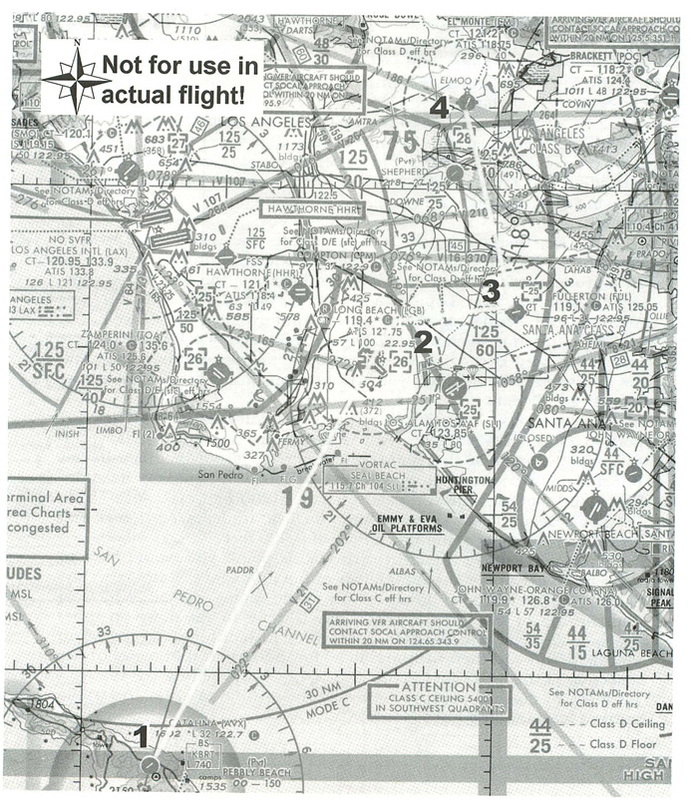 One of your main obstacles is the Los Angeles Class B airspace (formerly known as a Traffic Control Area, or TCA). Right around Los Angeles International (LAX), this area goes from the ground to 12,500 feet MSL. As you get further from the airport, the “floor” of the airspace rises, first to 2,000 feet MSL, then 2,500, then 4,000. The limitations are shown in hundreds of feet, with the ceiling listed above the floor with a horizontal line separating the two numbers. These sections are loosely based on concentric rings centered on the airport, so a cross-section looks a little like a wedding cake placed upside-down on the airport. You need clearance to enter the Class B airspace, so I had to find a route that either goes under one of these cake layers, or around the cake altogether. A direct route would take you through a section with a 2,500 foot floor, which is a little lower than I want to plan for, so I chose a different route. I can’t send you too far to the east, however, because there is the John Wayne Orange County Airport Class C airspace (which requires radio contact with air traffic control before you can enter). Portions of it has floors as low as 2,500 feet, and the tops reach up to 5,400 feet, so going over or under this airspace would be more trouble than it’s worth. But wait; there’s more. The various airports with control towers have their own Class D airspace, which extends from the ground to an altitude shown in a broken box. For example, the top of this zone is at 2,600 feet over Long Beach airport, and 2,500 feet over Los Alamitos AAF. We’ll need to find a route that avoids these as well. The solution is to climb to 2,800 feet after taking off from Catalina and flying right over Long Beach airport. This altitude is a little low for the water crossing, but you will be flying under IFR routes that start at 3,000 feet. After you pass Long Beach airport, you will turn right. The VFR portion of the Los Angeles TAC shows that you could follow the Riverside Freeway at this point, but this road is not included in the FS5.1 default scenery, so you’ll have to follow a compass heading. The 2,800 foot altitude will give you just a 200 foot clearance above the Long Beach Class D zone, and you’ll be under a portion of the LAX Class B airspace that has a floor of 6,000 feet. If you don’t make the right turn at this point, you would have to descend to get under the 2,500 floor of the LAX Class B airspace, but that would be tricky to do since you would almost certainly have to clip the top of the Long Beach Class D zone to get down in time. Instead, I’ll head you east for a bit, until El Monte is directly off to your left. You can then turn and head for the airport and travel under a section of the LAX Class B that has a 4,000 foot ceiling. All that you have left to do then is start your descent in time to enter the traffic pattern for a landing at El Monte. By about this point, you may be wondering just how you’re going to be able to find your way through this maze of restrictions, especially if you don’t have visual references like the Riverside Freeway to guide you. The answer is that you will use a combination of three different navigating techniques. For the first leg, you will use a VOR beacon as a guide. For the second leg, you’ll use old-fashioned ded reckoning (“ded” is short for “deduced”). And for the final leg, you get to home in on a non-directional radio beacon (NDB) on the field at El Monte. The three legs are detailed for you in the flight log, which I have filled in for you. The VOR for the first leg is the Catalina VOR, located about a mile and a half from the airport. By tuning the OBS to a 12-degree heading, you can fly the outbound radial which will take you straight over the Long Beach airport. I will assume that you are flying in calm conditions, and that you will take off from Catalina using Runway 4. As soon as practical, go to a cruise climb (about 80 knots at full throttle) and fly the runway heading until the VOR needle centers on the gauge. Then turn to a 12-degree heading and keep the needle centered. Don’t forget to level off at 2,800 feet when you reach that altitude, then throttle back and trim your aircraft for straight and level flight at 130 knots at that altitude. You’ll want to get the trim settled down before you make landfall, because you will be busy enough navigating without worrying about busting an altitude at the same time. You will pass over the Long Beach airport when the DME read-out for the Catalina VOR reads about 29 miles. (NOTAM: in some of my test flights, the scenery for Long Beach did not appear; instead it remained a rectangular gray patch next to a freeway. This may be caused by a low-memory condition.) Continue two miles past the airport, until the DME reads about 31 miles or until you can see the airport out the back window of your Cessna. The second leg starts with a right turn to a magnetic heading of 60 degrees. This takes you along the edge of the LAX Class B airspace that has the low floor, with plenty of room to spare. There are no landmarks you can use for this leg (though you will be flying directly to Fullerton Airport, but this is not included in the default scenery). You will make your turn onto the third leg based on the El Monte NDB radio beacon, using your ADF (automatic direction finder) gauge. The ADF arrow always points to the beacon. So you will fly on your 60-degree heading until the ADF arrow points to 270-degrees, indicating that El Monte is at right angles to your left. Turn to a 330-degree heading, and continue on until you see the airport. This third leg is about 12 nautical miles long, and you will need to descend to 1,300 feet by the time you reach the airport so that you are at pattern altitude when you get there. Since you will be cruising at 2,800 feet, you must lose 1,500 feet, which will take three minutes at a typical 500 foot per minute descent rate. Since you will be traveling at 130 knots, you will need to start your descent at least 6.5 miles from the airport, so plan on starting down (by reducing your throttle) a minute after you make your turn onto the third leg. Once you arrive at the airport, assume that the tower clears you to enter a right downwind for landing on Runway 19, and then clears you to land. This means you will fly past the near end of the runway when you reach the airport, then turn to parallel the field with it off your right side. Turn base and then final to set up for your landing. You can use the World Airports menu to go directly to Catalina. Choose the “USA - Los Angeles” scenery area, and then “Avalon - Catalina - Runway 4” from the list of airports. You then need to set your radios and other equipment. Since you are going to be flying under VFR rules, you want to make sure that your transponder is “squawking” 1200, the VFR code. Your NAV1 radio should automatically be tuned to the Catalina VOR (111.40), but you will need to adjust the OBS setting to 12 degrees. This will set up the gauge so you can intercept the radial after takeoff. Finally, you need to set up the ADF. Choose the ADF option from the Nav/Com menu. Enter the frequency for El Monte, which is 359, and then check the “Activate ADF Gauge” box. The ADF gauge will replace the second NAV gauge on the Cessna panel. Choose OK to return to your cockpit, and you’re ready to fly. If you’re looking for an extra challenge, set the time of day to Dusk, and pretend that you’re flying home after a great day at the beach. Los Angeles may be crowded both on the ground and in the skies, but with a little careful planning, and a lot of attentive piloting, you can wind your way through the different types of airspace and make much better time than the folks stuck on the freeways.